It’s amazing how the entire course and direction of your life can change in an instant. A year ago I didn’t even know what a Buddy Walk was; much less think I’d ever be participating in one as a parent of child with Down syndrome. But here we were at our first ever Buddy Walk and we had a blast! Hanging out at our first Buddy Walk! The Buddy Walk was created to celebrate National Down Syndrome Awareness Month (I had no clue there even was a Down Syndrome awareness month) and to “promote acceptance and inclusion of people with Down syndrome.” In addition The Buddy Walk is also one of the largest fund raisers for the various local and national Down syndrome organizations. The way it works is you create a “team” and then set a financial goal for your team. This was our first Buddy Walk and we were a little late to the game, but we still managed to meet 143% of our financial goal! I say we, but I really mean all the awesome people on “Team Noah’s Crew!” We were humbled by the number of people who gave financial gifts, many of whom we had only meet through this website and our Facebook page. How cool is that? Thanks to everyone who helped us meet our goal! Since this was my First Buddy Walk I didn’t really know what to expect. Actually, let me rephrase that. 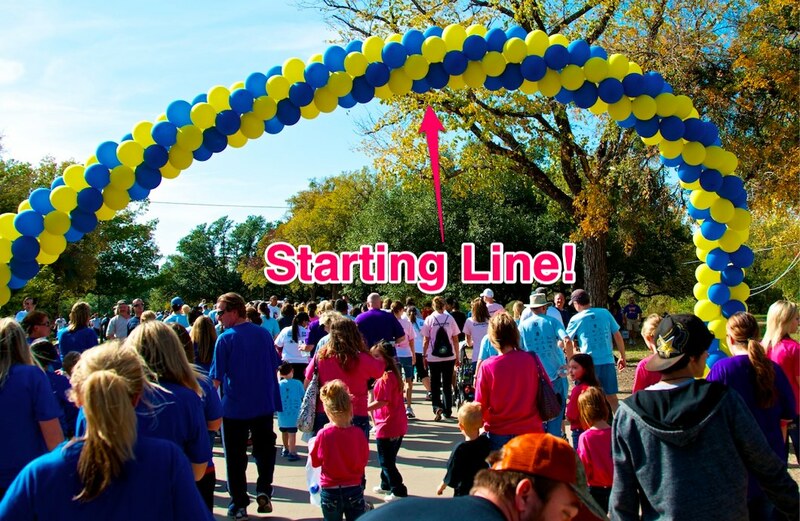 Since this was my first Buddy Walk, I didn’t really know how I was going to feel. I knew there were going to be thousands of people (of various ages) with Down syndrome there, and up until this point most of the people we have meet with Down syndrome have been young children. So I wondered how I was going to feel being around so many adults and teenagers with Down syndrome. Let me explain. 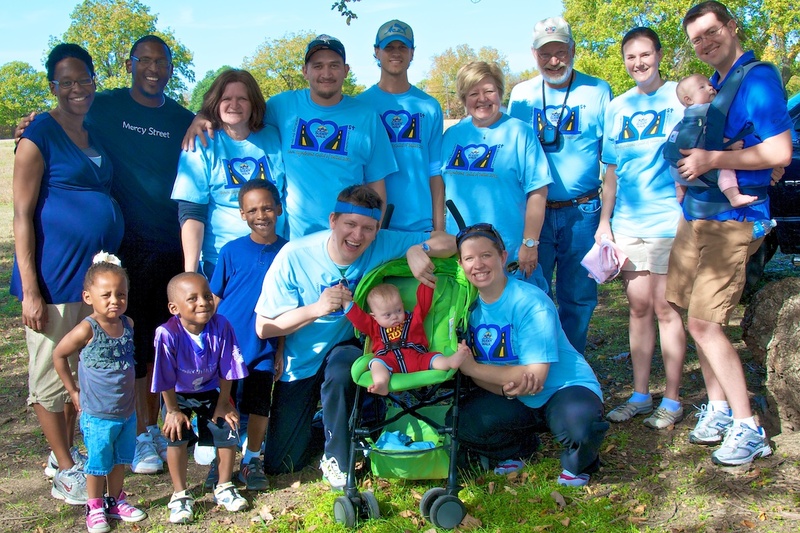 Before the Buddy Walk I wondered how I would feel seeing so many adults with Down syndrome. I had meet a few older people with Down syndrome in the last 10 months or so, and after meeting them I always walk away with a strange mixture of emotions. When I met someone much older than Noah, I felt like I was looking at a window into the future of my son’s life. I would pay close attention to every detail of our interaction in order to gain an idea about what the future might be for our son. Did he get my joke? What does he like to do for fun? Does he work? Does he talk? If so, could I understand him easily? Does he walk well? Etc.. Sometimes these interactions made me feel sort of sad, other times they deeply encouraged me. In the back of my mind I would try to envision what it would be like if Noah was like the person I had just met. I’ve meet a wide variety of people with Down syndrome and I’d often ask myself questions like; How would I feel if he couldn’t talk? And if he did talk, what if only a few people could understand him? How would I feel if he walked with a limp and struggled to keep up? On the other hand how would I feel if he fell in love, and got married? How would I feel If he had a great job that he enjoyed? How would I feel if he changed the world? Rocking his first Buddy Walk! Of course, like any parent, I think my child is the smartest, cutest, most gifted, most awesome kid in the whole wide world. So anytime I met someone older with Down syndrome who wasn’t as efficient in (fill in the blank) as society tells us they should be at that age, in the back of my mind I’d think about how much better Noah’s going to be at (fill in the blank) when he becomes that person’s age. My wife, her mother, and our wonderful son. 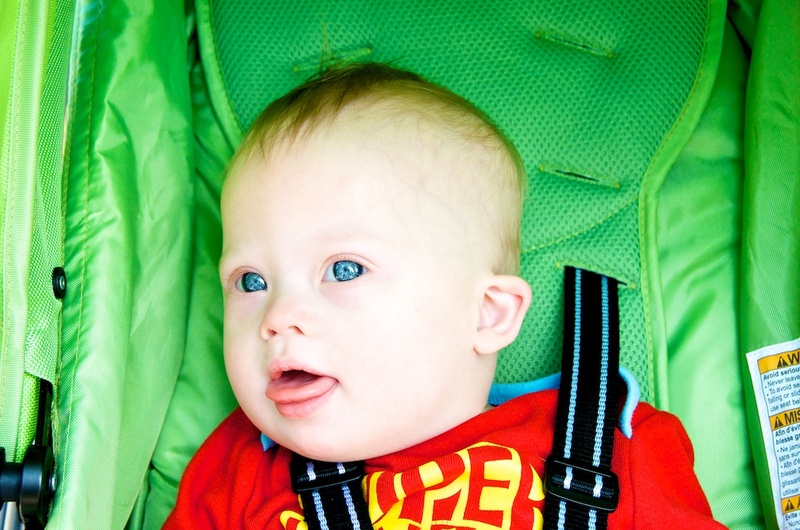 Having a child with Down syndrome has caused me to radically reevaluate my theology of personhood. I’m learning that I’m not the measuring rod of what an ideal person should be like. (In fact, I’m far from it.) Most of all I’m learning to trust God more. I’m learning that He is in charge, not me. I’m learning that He knows best. Not me. And these are great lessons to learn. “Where where you when I created the Earth? Who tells the ocean how far to come upon the shore? Can you find your way to where lighting is launched, or to the place from which wind blows? Can you get the attention of the clouds? Do you know how the hawk learned to fly? We love this group of friends and family! My family went to our 1st Buddy Walk last year, I remember thinking “God, I can’t get through this” because I wasn’t for sure how I’d react. I didn’t know what to expect. i”m glad we went though because I saw that my daughter can do ANYTHING she set her mind to do! There was a Down Syndrome teen playing guitar and singing with a band and they passed out awards and there was a teen who had DS and graduated with a GENERAL DIPLOMA! That made me determined that our daughter would graduate with a diploma! May be hard work but like my husband said “I haven’t seen a more determined mommy than you are”. At 1st I was “scared” of what the future would hold for our daughter but now I give it to God because after all HE is the one in control has been since before I got pregnant with our daughter. HE knew she would be diagnosed with Down Syndrome, HE knew that as parents we would be okay, HE picked us and for that I feel special because HE gave us a special angel baby!!!!!!!!!!!!!!!!!! I’m so thankful he looked past my husband and my faults and chose us anyways, I feel honored, he chose me a NOBODY so that I can go out and prove that I am SOMEBODY and a force to be reckon with when it comes to our daughter. I don’t take NO for an answer, if I want her to have a new therapy I push for it until I get that YES, lol. I am a WARRIOR for not just my child but for every child that has been diagnosed with Down Syndrome (or UP syndrome as we call it). ; I hope you, your wife, and NOAH have an AWESOME DAY! But here we are over a year later and things have pretty much settled. We’ve had a front row seat to God’s faithfulness in Noah’s life. It’s been amazing! And oh, how we’ve grown. How old is your daughter, and is she your only child? My daughter is now 15 months and we also have a 29 month old (my children are 14 months apart). My son Nate (29 months or 2 1/2) is her fierce protector. Kaitie Beth can be crying and Nate will run into the room and be ready to fight whoever is making her cry! 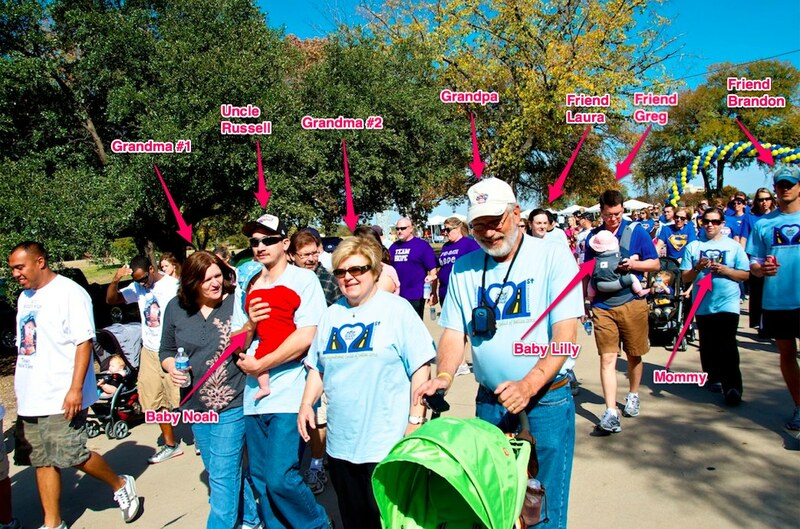 I can totally relate to your feelings at your first Buddy Walk. I thought I was going to cry when the special needs cheerleaders did their routine & dance number. What I have come to realize is that I am madly in love with my child & hardly know those teens and adults with Down syndrome that I saw. My love for Levi makes looking at the future easy now. He makes me so happy now & he will continue to bring me joy as he grows into an adult. Great post, by the way! Thanks April! And thanks for linking to your blog, I hope lots of folks check it out. Thanks, Rick. Levi turns two next week and has a 3 year old big brother, Adam. How old is his big brother? I bet they have a ton of fun. Becca, thanks for posting this! I can’t wait to check it out. I am so encouraged by your post. Otto is 6 months old, so our first Buddy Walk will be this year. It is refreshing to know that I am not alone in my feelings about Down Syndrome. You are so right about the “I” statements. Otto has already surprised us with so many things that we try not to put limits on him and we don’t allow others to either…at least I don’t say the limits out loud…they still ramble around in my brain. I love this little guy. His big sister loves him. His daddy loves him. But more than anything, God loves him. He chose us to raise him, just like He chose us to raise our daughter. We aren’t super special people, but God thought we’d make a good family. We will just continue to operate on the fact that He knows what he’s doing. Thank you for the reminder! Great thoughts Brandy! I know just what you mean by the way. Trying to control my thoughts can be a tough one…but I know it’s important. I think I’m much better at it now, than I was a year ago. Thank the the Lord! That was great! Right on! Love how you leave yourselves open for others to have questions! That’s what makes you special and identifiable. Bless you! Thanks for the kind words JoAnn. Do you have any children? Where are you guys from? I have been following your page since we received the news that our son would be born with down syndrome. I have often shared photos or summaries of your stories with my husband. Before Gabe’s diagnosis my husband had NO experience with down syndrome and mine was limited to brief encounters at the hospital. My husband and I have put a team together for our first even with the local down syndrome community. Our family and friends have pulled together and raised enough to put us in the top six team! Our little buddy isn’t even here yet and there is so much support for him already! I have had a lot of anxiety about the march and activities. Seeing al ages of individuals at all levels will make everything very real for us. Nt sure how you can go into something like this and not question your child’s future. I am excited for our community to know how much we already love and care for our son, and how determined we are to do everything we can to guarantee a life and future that he is satisfied with. Sherry….in the top 6…? Wow! Congrats, that’s awesome. I love hearing about all the support you all have surrounding you. That’s so important. Please tell your husband he can contact me anytime. He can email me, facebook me, tweet me….I’d be happy to connect with him. -On the journey with you. Soo..I would say our first Buddy Walk was a HUGE success! It was like big arms of the entire community wrapped around my family and it felt pretty darn good 🙂 Seeing and feeling that support also gave us the courage to start Ruby’s Rainbow…and we are looking forward to giving out our first scholarships this summer!! Woo Hoo!!! Our kiddos are the coolest and I just want to shout it to the rooftops everyday 🙂 Lucky we are indeed…..
Raise the roof indeed…! Wow, you guys rocked it! Thanks so much for sharing that. We are down in Austin..YEE HAW!! Not too far from you guys…Texans are cool 🙂 If you are ever this way we would love to get the pip-squeaks together! I will check out the gravatar thing..thanks! That would be fun! And thanks for sharing the info about the scholarships. I AM THE SAME WAY.. my little man is 3mo old. I find myself comparing little Marcus to other children. I ask myself, “Will he be happy?:.. “Will I be able to understand him?”.. I want him to feel loved and accepted. Sure, it’s cute he drools now.. but it won’t be so cute when he’s 30. Will he be high functioning? — Our thoughts are natural. Thanks for being honest and willing to share it with all of us. Me and my husband follow your page and your stories very close. Thank You! Thanks for the kind words. Are you guys connected with us on our Facebook page? That page has really been helpful to me. There’s almost 15,000 people on there sharing pictures, videos, blogs, etc…It’s great to see so many people with Down syndrome doing such great things. Where you guys from by the way? Yes.. I follow you on FB and found you through the footprint page. We are in San Dimas, California. Home of BIll and Ted. I LOVE LOVE LOVE reading about Noah… I am even crying as I write this because I was SO scared when I found out Marcus would have Down Syndrome, I didn’t know ONE THING other than what I saw on “Life Goes On”.. lol .. I love how honest you are. You seem to type what we are all thinking. I am joining a local group,, Up for Down. I am very nervous and excited to meet other families. I love my family, but I think they are still in denial. When I was pregnant I had an Amnio done. My 3rd trimester blood work was in question. We found out Marcus had DS.. My family would say “Well, is it for sure?”.. they wished so hard that I would fall in that SMALL TEEENY tiny percent of people who have false Amnio results. When Marcus was born the OB came in and told me Marcus did NOT have DS, that the test was wrong. He did not have any features of DS. My family just ATE That up. Marcus has the heart conditions and will have surgery before he is one years old.. but other than that, no one can really tell he has DS. They did more tests, and the tests still came up with an extra 21. I don’t know if this has ever happened to anyone and if you go to my FB maybe you can look at his pictures. I can see the DS in his eyes. Marcus also has low muscle tone and in PT. I don’t care what he has.. we had many miscarriages before little Marcus.. we are SOO happy he is here and we are IN LOVE with this kid.. he makes me smile everyday! If you go to my FB, he is in the photo album :”Marcus Anthony Welch” — Thanks again for being open and honest.. The annual Buddy Walk here in town is one of my favorite days of the year! This year we are celebrating our 10th anniversary!! A lot of celebrating will be happening! I work in the Special Needs Ministry field, and while 2 of our 5 beautiful kiddos do have a disability, it happens to not be down syndrome. BUT….that is all changing!! We have recently received pre-approval for a beautiful little 2 year old girl who is currently in China who happens to have down syndrome. As I am busy dreaming of what lies ahead for our family and this precious new addition, the Buddy Walk always comes to mind. What an incredible honor it will be when, one day, our family will proudly attend the Buddy Walk in honor of our precious Emma Claire! I am giddy with excitement just picturing it now! Thank you for your witty encouragement and honest views of raising a child with down syndrome! Wow, thanks for sharing! 10th anniversary?? Wow! Congrats. I started a special needs ministry at my former church about 10 years ago that consists of monthly respite nights for children with special needs and their siblings, buddies for children during Sunday School and a specialized room for children with specific physical disabilities that warranted specialized care. From that ministry, God planted a dream in my heart to start a camp for children and young adults with special needs. We formed our non-profit in March 2008 and are going strong year-round. We offer camps and programs for ages 4 – young adults. We have a blast!! Wow, this is very cool! Maybe we can bring Noah there one day..! Keep up the great work, and I look forward to learning more. Thanks for this post, Rick! Very well said. 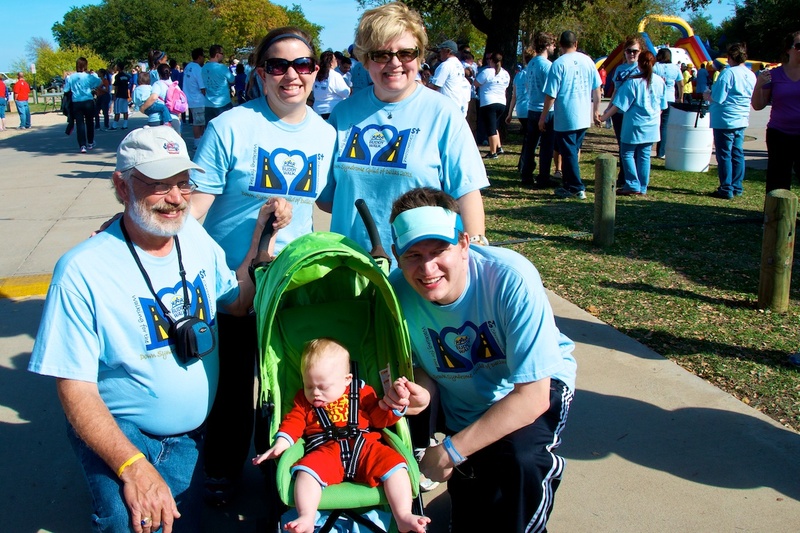 We went to our first “buddy walk” last year when Nolan was just 8 weeks old. I felt (and still occasionally feel) a lot of those same emotions. I feel so blessed by your blog. Melissa, thanks so much for the kind words. I really appreciate them. How old is Nolan, and how is he doing? What a great post.. Although our family does not include anyone with down syndrome, one of my twins has cerebral palsy. I believe that it’s similar to DS in that you never really know how it will affect a person until they become who they are meant to become! We have a good idea how Eric has been effected in that it seems to be only his legs (not speech or arms) but he is still not walking at nearly three years old. I wonder all the time what he will be able to do.. Walk? Probably… But maybe with an odd gait. Run? Jump? Play soccer with his brothers? Who knows. I also look at anyone older with CP like Eric’s to maybe get a glimpse of the future. I used to obsess about it a LOT. Now I have come to a calmer place. Eric is going to be who he is. We love him regardless. I don’t happen to share your faith in God but I do understand the idea of accepting that we cannot control it all. I am learning how much I have to be grateful for and try to forget the rest. 🙂 Some days are harder than others but I find as he gets older it gets easier. Hi RIck, You know how parents of children with Down syndrome find the “R word”, used as slang, offensive? Parents of children with a physical handicap find “lame”, used as slang, offensive. Thanks so much for your comment, to be honest I didn’t even really think about it. I am so sorry. I could totally see how that could be taken offensive. I’m very sorry if I offended you (or anyone else) in any way, I certainly didn’t mean to if I did. I’m glad you took the time to let me know. By the way, do you have a child with a physical handicap? I didnt even know that was the meaning of the word. I just looked it up in a dictionary cause I was confused by your comment. I thought it meant boring. Thanks for the info I will definately try using a different word now. I’m sorry about some of the feelings you are dealing with. Do you have a good network of friends and family? I can’t even begin to say how important our friends / family were to us when Noah was born. What sort of genetic disorder does your daughter have? We are living in Brooklyn, but we will be moving to LA/Orange County in California this weekend. You are right, I need to find some parents for support. Right now, I do not know any families who have children with special needs, so I feel even more alone in this journey. My daughter has a duplicate on chromosome 8p23.1. Her prognosis is very similar to a child with ds. Thanks, Rick! We have not done a buddy walk yet. My older children do not know about Liam’s diagnosis. It sounds strange, but even my oldest who is nine would not fully understand that the diagnosis is not the definition of Liam. They all know that Liam needs extra help sometimes, but we all do and that’s okay. That being said, our family’s participation in a buddy walk would undoubtedly raise questions that frankly I don’t want to answer. So, long story short(or long), I have the same sort of feelings and think my kids will as well. However, I do realize that it’s not unusual and feel that my other kids should see Liam as who he is, not compare and contrast as it would be so easy to do. We do try to support the cause however, and for Liam’s first birthday we asked for donations to nads in lieu of presents. God is so awesome! Thank you for this amazing website. I totally understand how you feel about the future and your child with Down syndrome. Bailey is 13. She is so awesome. She has taught us that everyone is great and that God loves everyone. We will have a lot of decisions in her life in the next couple of year. Thanks to you post I am reminded that God is in control and to love Bailey today for who she is and let God take care of tomorrow. God bless! Thanks for the comment. I”m never heard of an adaptive recreation event, but it sounds awesome! Do you get the chance to go to many of them? I actually work them! It is my favorite job by far. We have a lot of classes/events for people with special needs. Things such as adapted sports leagues, craft classes, fitness classes, acting class, swimming lessons/open swim, and plenty more. Depending on the demand each city offers different programs, for example I work in the suburbs too and one city we offer mostly kid and teen programs with mostly inclusive programs. You should check into the recreation programs and see what is out there for Noah when we gets a little older. As a special education teacher for over 16 years I have seen what great parent support and involvement can do for any child regardless of disability or no disability. I am currently a Project SEARCH teacher where I have the opportunity to interact with some of the best students in my area. My students are learning job skills everyday. I am at the program in Coeur d’Alene, ID hosted by Kootenai Health (our local hospital). Project SEARCH was started 16 years ago in Cincinnati, OH by a nurse. This is a great program to check out for your kids between the ages of 18-21. The program is focused on job and life skills and the program works. There are over 200 other Project SEARCH programs internationally. For more info you can see the website http://www.projectsearch.us. This year the annual conference is in Austin, TX. Project SEARCH can bring hope for the future to so many young adults with disabilities. My favorite story out of Cincinnati Children’s Hospital was that of a young woman who just gave birth to a baby with Down Syndrome, she was dealing with all the same questions I have read in Rick’s posts/blog. She was wondering will my baby every be independent? will my baby walk? hold a down job? get married? As she was thinking all these things in walks a Project SEARCH student intern to re-stock the items in her room, that Project SEARCH student intern had Down Syndrome and looked at the baby and said “What a cute baby!” and continued to stock the room perfectly. Then the mom realized that yes her baby could grow up to do so many things. That is an awesome story, thanks for sharing it! And thanks also for posting the link. Also thanks for the work that you do. Project SEARCH sounds like a great organization! The conference in Austin is July 23-27. Unfortunately due to budget issues I will not be attending this conference. I would recommend the conference to people in your area and maybe at your local hospital if you do not currently have a Project SEARCH in place. The conference is a great way to learn about how start a Project SEARCH that maybe Noah will attend in 16 or so years. I am looking forward to continuing to follow your blog and facebook posts has he grows and matures. I have always preferred to work with the older students with special needs, high school and beyond. Bummer! I look forward to learning more about your story as well. Thanks so much for all you do. We have not yet attended a Buddy Walk. However, I can so relate to your emotions. I absolutely ADORE my daughter and can’t imagine her being a more perfect fit for our family. I have no desire to change one thing about her. On the other hand, there has always been a little bit of that “She’ll be better at…” and “I hope she can…” It’s holy tension between desiring God’s best for her and making sure she is challenged and progressing but not wanting to shove MY agenda and expectations on to her. It’s hard not to wonder “what if things had been different?” or “what if…(made up future scenario)?” but I can’t look at her and not know the wisdom of God in all things and how He uses the simple to humble the wise. Our babies are perfect, unique creations that reflect the character of God in ways that most of us can’t or don’t. I experienced the same feelings at our first Buddy Walk. I don’t think I was nearly as at peace with down syndrome as you seem to be. I looked at the older kids, the teens, the adults and wondered about Alli’s future. But, just like with any child, you just don’t know. I do know this, she is so loving and respectful of people’s feelings. She’s 9 now and she’s amazing. Today, she did a hula hoop routine at the 3rd grade talent show. There were dozens of “typical” kids that sang, danced, and played musical instruments. Alli went up and rocked the house. I’m proud of how hard she works and today she showed the world. You’re giving Noah the love, respect, and attention he needs to be a huge success. He will amaze you and make you proud every day. Thank you so much for the post. It was on time for me. As we are in the process of adopting our child with DS thru our state system. He has been with us for 8.5 months and in every aspect is our child. If anyone knows what it is like to adopt thru a state system they know they know the emotional termoil it can bring on top of Dr appointments, physical therapy etc. We live with the fact that they can take our son back at any moment and give him back to the ones they are trying to protect him from. Things change everyday and many times your hands are tied to what you can do. We now have to hand our son off to a man who has chosen to meet him only one time. The part of you story that held a place in my heart so much today it the part where we take every day at a time. Enjoy each moment that we have and to trust God who has our future and the future of our son in His hands. I can do very little to change the future. I has to be up to Him. Thanks for the post. I meant hand him off to someone who has met him only one time for visits. Our first Buddy Walk was tough. I like you kept looking to see what my son would be like in x amount of years. 11 years later and I look back and think “what were you worried about Amy?” He has come so far and achieved all you hoped and dreamed. The hardest parts were when people (as loving as they were trying to be) would say “oh look at him, he is going to grow up to be just like, fill in the blank of the 20-40 year old with Down Syndrome) and I would walk away with tears in my eyes thinking you can’t put my son in the same box as that person. Because they share Down Syndrome does not mean they are the same. 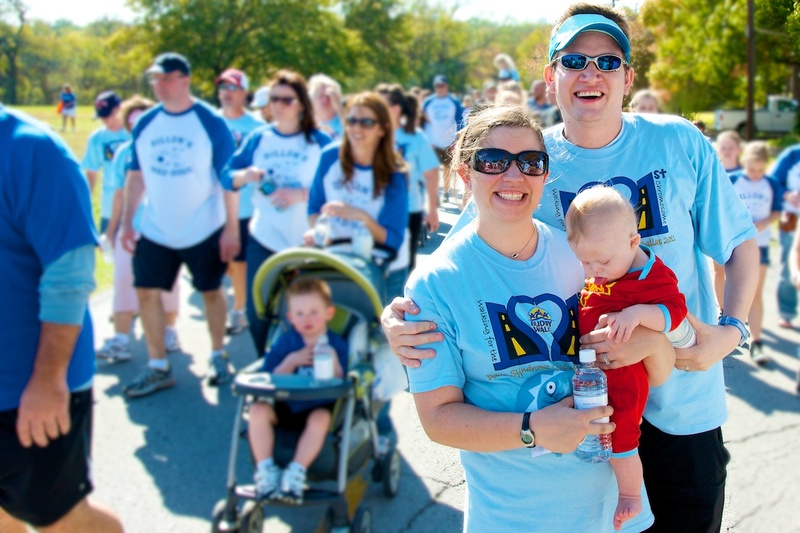 As the years have gone on I have learned the Buddy Walk feels more like a big family reunion. A place we all come together to celebrate our children/young adults and adults that all share an extra special something but at the same time are still different because we are all made unique and in God’s image. We are getting ready to do our first buddy walk in October. Im very excited to be able to raise money for a group that has done so much for us. Our son is five months old and we have been connected with them since we were in the hospital. They are always there when you have questions and they host so many great programs for parents, and kids & adults with DS. They have eased our minds, and have given us lots of hope for the future. One of the things I heard at our very first meeting was a guy that told us that there would be a time when we would forget sometimes that our child has down syndrome. I was very skeptical, but five months later there are days I completely forget until someone reminds me. Just wanted to share that as a mom with a 3 year old with DS I so share your struggles about worrying about the future, so I thought I would share with you what a good friend of mine sent me the other day. In a nutshell she said that we should never need to worry because if we are totally immersed in knowing God’s plan is the best we should let go and not try and make it what we want it to be but instead sit back and watch with amazement how He unfolds His plan, and in reality what could be greater! However, as a human it can be hard and I will confess that I can still so try and control things. I do believe, through watching God work through Treyton that stereotypes are starting to break, Praise God! Our 3 year old can read about 150 words, knows his colors and can jump on the trampoline–just remember GOD IS GOOD! Thank you so much for this! Tomorrow marks the 1 yr anniversary of “upside down day” – the day I went for my 22 week ultrasound and there were “unexpected outcomes”. Our daughter’s heart defect (and the type it was) prepared the MDs and us for a strong possibility of DS. Its amazing to think how far we have come emotionally since that day. Its definitely one day at a time around here too. Our faith is so much stronger, as for us, it was also the one thing that we could lean in during the darkest of days. Thankfully, God continues to help us see the light and beauty in the gift he has entrusted to us. Our Katie is thriving and an integral part of our family, just like all of our other kids. Thank you Smith family…I truly believe God is working through you and your website. It helps make the “not so great” days much easier to handle and changes my perspective for the better! Thank you so much for your honesty. I appreciate it so much. When it comes to discussing our 9mo. old daughter’s DS diagnosis, I feel like I always have to have the smile on my face and reassure everyone that everything will be okay. It’s nice to know that someone else has similar fears and struggles. 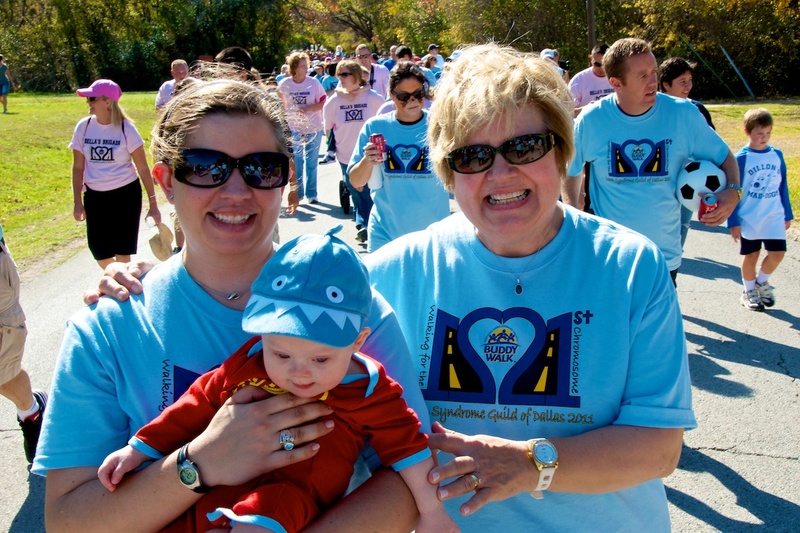 We will do our first Buddy Walk in OKC this year. I’m looking forward to it! 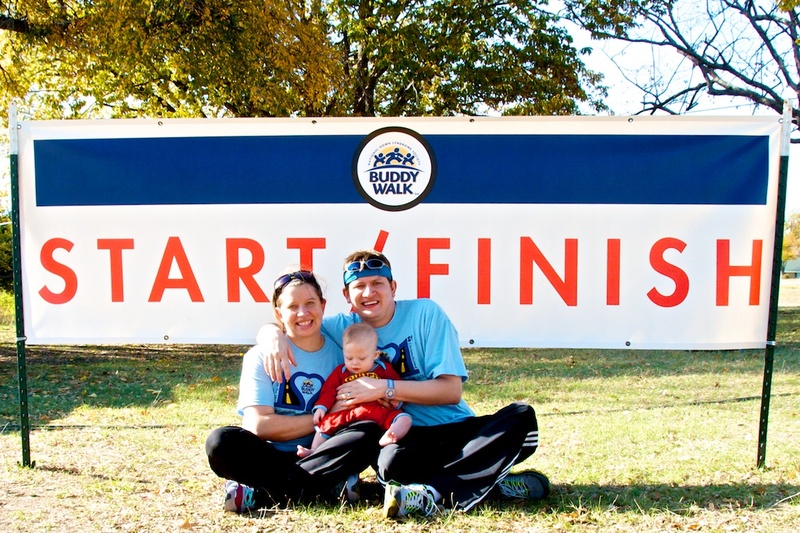 Mindy, thanks for the kind words, and I can’t wait to hear how your first Buddy Walk goes! Be sure to tell us all about it afterwards. By the way, are you on our Facebook page yet? Everyone there enjoys pictures, so feel free to post one of your litte one. I can relate to those feelings, and I also agree that the God who put the earth into motion has better plans for Seth than any ideal future that the world would come up with. We can be sure that God will ultimately use everything for His glory and for the benefit of those who love Him. I took the words right out of my mouth. 🙂 We miss you guys. Let’s plan some summer fun! Well, we are 2 Buddy Walks down now (Tarrant County)…but I must say that the same gush of emotions came upon me both times. The hardest part for me is looking at a stranger, but seeing my son in them. And I’m being honest and not saying this to hurt any feelings, but whatever I notice in another child with Down syndrome, that “I” don’t like/want for my son—I focus extra attention on that issue …so I understand your thoughts. BUT, now I also look forward to the Buddy Walk because it says to me that my family and friends support Nic in his life and the “extra” gene God knows he can handle!